Festive dessert with a hint of cinnamon and spice. A fun alternative to pumpkin pie. Bake the gingerbread according to package directions or make a homemade recipe. Meanwhile, prepare the pudding according to directions and set aside. Stir the pumpkin pie filling, sugar and cinnamon into the pudding. Crumble one batch of the gingerbread into the bottom of a large, decorative serving bowl or punch bowl. 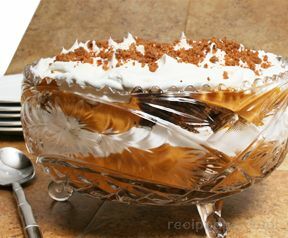 Pour half of the pudding mixture over the gingerbread then a layer of whipped topping. Sprinkle the top with crushed gingersnap or amaretto cookies if desired.